Photos by Carole Dearman except for Gassart House photo. Schmucker, a local cabinet maker, secreted a closet in the home. B. Davidson purchased it in 1999.
stone room in 1949. The home was named after Bert, Meave and their two daughters Gen and Fran. 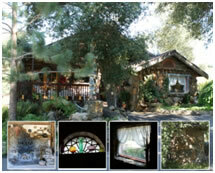 Granddaughter J.B.Bowman and husband Ron Bowman were the owners as of 2013. Circle T Ranch, c. 1940. A stone one-room bungalow built by the Losch family as living quarters and later used by their ranch hands. and son, “Ott” were both noted master masons. The Johnson Home, 1920. 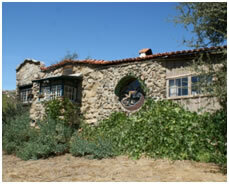 Built by H.M. Johnson, manager for the Mountain Commercial Co., which developed the Descanso Park Terrace Subdivision. W. Chappelow. Inset: 1. Front view from street. 2.Back of house showing rock work detail. look of a stone cabin through all upgrades. 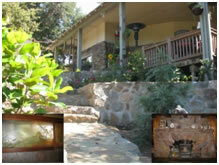 Descanso Rock Cabin Rental, 1929. Built by Peter Jacobs in Descanso Park. 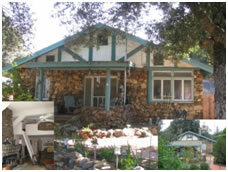 This Craftsman style dwelling is owned and rented out by S. Arthurs (2013). Faced with garnet-embedded local rock and a heart-shaped rock below the mantel (a trademark of Jacobs cabins), it is an historic landmark. Lilac Ridge Cabin, 1918. Located on the stage route to Stonewall mine. Local lore suggests that the building was used as a stage stop. L. Roberts and L. McClellen, local willow-furniture manufacturers, owned this property for several years. photo2. Front of same cabin. photo3 Old stalls made into house. Lulu’s Rock Cabin, 1928. Built by Peter Jacobs. 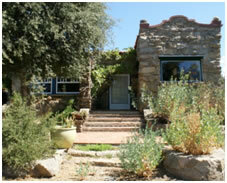 This dwelling features native rock and “oatmeal” mortar made of river bottom sand. The fireplace is local hand-dressed blue granite and the original cabinets remain. The kitchen ceiling is pressed copper. L. & D. Kennedy Rock House, 1922. 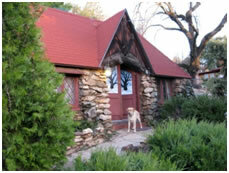 Built by Peter Jacobs as a clubhouse for residents of Descanso Park. It is thought to have the first telephone installed in Descanso Park and still has an original junction box with wires that led out to nearby houses. Insets: 1. an unusual art glass window. 2 Jacobs mantle. Schaefer, who also ran the Hulburd Grove Stables. 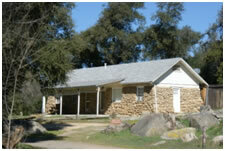 Once used as quarters for the Oliver Ranch Dairy, the house became known as the A.T. Hawley Rental Cabin. It is currently owned by the State of California. Mack House, c. 1930. Built by the Lanes. 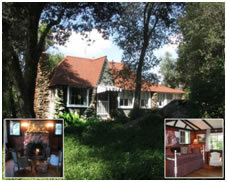 This Tudor style home has period lead glass windows and a steeply sloped roof. Electricity was installed during the 1940's. This structure and outlying buildings are located on Highway 79, which roughly follows the Kumeyaay Trail. Gassert House, 1929. 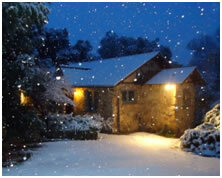 Built by a steel businessman in Descanso Park subdivision. This country retreat showcases Harry McCoy’s masonry expertise. Vacant for an extended period of time, it was purchased by a local teacher in the 70’s. Currently (2013) owned by the Gasserts.